Announced as a European exclusive to coincide with Legend of Zelda: Link Between Worlds, the TriForce adorned 3DS XL – bundled with the Zelda title – seems to be coming to the US after all. 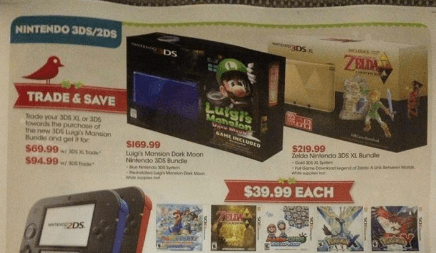 GameStop’s leaked Black Friday ad lists the console for $219.99. Standard 3DS XL units run $199.99, so $20 for the latest Zelda is a bonus if you’re in the market and don’t mind the digital copy. In the UK, the console was set as an EB Games exclusive. It’s possible the system will remain locked to GameStop over here, although that will have to wait for confirmation from Nintendo… or more leaked ads for the shopping obsessed holiday. If you are searching for other deals, current generation copies of Battlefield 4 will run only $40, and a year of PS Plus will be available for its lowest price ever, $30. The ads also state they will have PlayStation 4 and Xbox One units available for those who missed pre-orders.